(CN) – Accusing a Silicon Valley billionaire of abusing the initiative process, an environmental group urged the California Supreme Court to erase a November ballot measure to divide the Golden State in three. The Planning and Conservation League – one of the country’s oldest and most influential environmental groups – argues that because the ballot measure would obliterate the California Constitution and governing system, the Legislature is responsible for placing it on the ballot. The group claims that Proposition 9 – also known as “Cal-3” – should have required higher ballot qualification and wants it struck from the upcoming ballot. Elections officials cleared Silicon Valley titan Tim Draper’s ballot initiative last month, after finding the proponents had collected more than the required 419,000 valid voter signatures. Draper, who funded a similar but unsuccessful proposal in 2014, says his plan offers voters a “fresh start” and will diminish labor unions’ influence over the state Legislature. 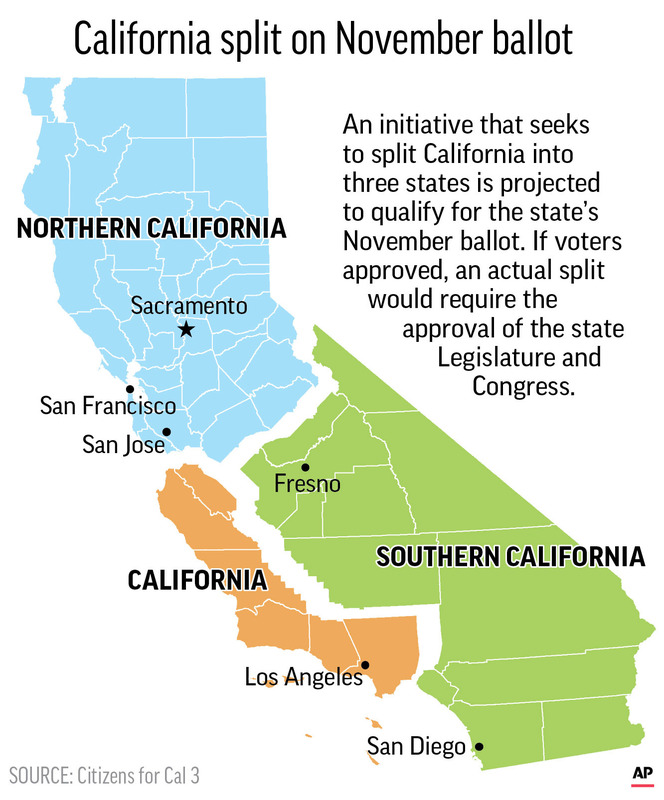 Proposition 9 seeks to create three states – Northern California, Southern California and just California, which would cover Los Angeles and parts of Orange County. The petition filed late Monday adds to the list of challenges facing the sweeping initiative. Draper’s plan would require approval from a majority of voters this fall and after that from both state lawmakers and Congress. Splitting up the most populous state would present monumental redistricting hurdles, add four new U.S. senators and require the new state governments to figure out how to redistribute existing debts and assets. Perhaps the most critical issue would be divvying up one of the world’s most complex water delivery networks. California’s current system is made up of myriad federal, state and local water infrastructure projects. In addition, the state legislative analyst office is “virtually certain” the measure would set off a cascade of lawsuits. “Can a statutory initiative measure like this one, which includes no state constitutional changes, set in motion fundamental revisions in California’s basic governmental framework?” the analyst’s report asks. If ultimately successful, the country would see the first split state since the Civil War, when West Virginia broke from Virginia in 1863. Opponents paint the measure as a radical distraction and unconstitutional. U.S. District Judge Kimberly Mueller dismissed the expanded representation lawsuit with leave to amend in February, ruling that the complaint is “fraught with non-justiciable political questions.” She will likely rule on California’s motion to dismiss the amended complaint sometime this month.